Few committees have been as forthright as the N C Saxena Committee on the violation of the Forest Rights Act (FRA) by the very authorities which are charged with upholding them—the state governments. In its report on the controversial project to mine for bauxite in the Niyamgiri Hills, the four member-committee headed by Saxena, a member of Congress President Sonia Gandhi's National Advisory Committee, has roundly taken the Orissa government to task for failing to implement the landmark FRA of 2006. The strictures are in relation to the Dongria Kondh , a small tribe that lives in the upland areas of the Niyam giri hills and is dependent on the verdant hills for survival. The report submitted on August 16, details the ecological destruction and, more importantly, the human cost of the Orissa Mining Corporation's project to mine bauxite in the hill. The state-owned corporation is in a joint venture with Sterlite Industries to mine the bauxite for global mining giant Vedanta's alumina refinery in nearby Lanjigarh. Sterlite is owned by Vedanta, a company that is seldom out of the spotlight, internationally and in India, for its poor environmental record and particularly for the proposed mining project. Apart from FRA, the committee found Vedanta violated the Forest Conservation Act (FCA) and the Environ ment Protec tion Act (EPA) "in active collusion with the state officials". The most blatant example of this, it said, was the act of "illegally enclosing and occupying at least 26.123 hectares of village forestland within its refinery, depriving tribal, Dalit and other rural poor of their rights". In view of the many violations, the committee "is of the firm view that allowing mining in the proposed mining lease area by depriving two primitive tribal groups of their rights over the proposed mining site in order to benefit a private company would shake the faith of tribal people in the laws of the land which may have serious consequences for the security and well being of the entire country". There were stronger words for the state's lapses and blatant dishonesty in implementing FRA. It noted that the district collectors of Rayagada and Kalahandi, where the mining area falls, had provided certificates saying they had letters from each concerned gram sabha (village council) giving consent to the proposed diversion of their forestland. However, none of these letters was attached to the certificates given in March 2010. The administration had not only failed to consult the tribal groups and other forest dwellers on the impact of mining on their lives, it had also not taken their consent. This is the first time a state has been hauled up so sharply for ignoring FRA and PESA, or the Panchayats (Extension to the Scheduled Areas) Act, which is applicable in Niyamgiri, a Schedule V area. The Saxena committee warned the district administration that it could be punished for failing to record the community and habitat rights of the Kondhs. "However, we are not recommending their prosecution, but we will suggest that they be sent for a specially designed training programme on FRA and tribal development." This, say organisations working with the Dongria Kondh, is a badly needed directive. Susanta Kumar Dalai, programme officer with Living Farms, a Bhubaneswar-based organisation that helped 24 villages in the area file community claims, complained it is next to impossible for tribal villages to file community claims. "We helped them (24 villages) file claims in October 2009 and the authorities have been making us run around for all kinds of additional information, such as maps." In fact, it is the responsibility of the district authorities to provide maps and electoral rolls to the gram sabhas, and also to call a meeting of the forest rights committees of the gram sabhas concerned to record the community and habitat rights of the Kondhs. None of this has been done, and none of the claims filed so far has been registered. 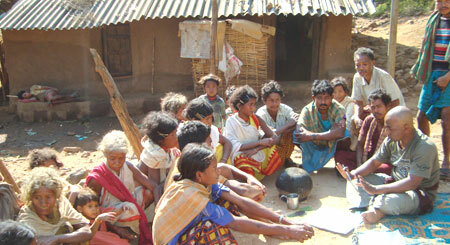 Talking to Down To Earth, Debjeet Sarangi, head of Living Farms, said it has been a struggle to help the Dongria Kondh. "They would not have known the status of their claims had we not filed an application under the Right to Information Act in the first week of January this year," he said. "As a response, the sub-divisional level committee sent back the claims towards the end of February. The reasons cited: 'procedures had not been followed and insufficient evidence'." Given the vague reply, voluntary organisations working on FRA have been running from pillar to post, seeking meetings with top officials of the Orissa Ministry of Tribal and Harijan Welfare and other departments to un derstand what constitutes "evidence". The outcome has been a visit by a group of block level officials on June 23. Forest department representatives were conspicuously absent. It appears to be a deliberate design to deny the Dongrias their rights, alleged Sarangi. 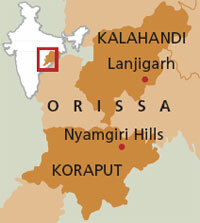 Orissa has a lot to answer for its treatment of the Dongria Kondh vis a vis the Vedanta project. Hopefully, the Saxena committee's findings will prod them into meeting the FRA regulations.